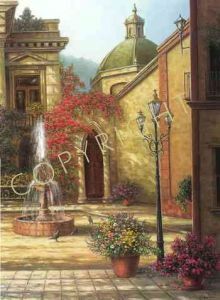 The historical towns and villages of Mexico have been an inspiration to artists for many years. The Spanish architecture with flowering courtyards and fountains seem to soothe the soul. The Mexican people know how to relax and enjoy the beauty around them. That is why I enjoy visiting and painting Mexico. I hope you can hear the bubbling water and smell the aroma of fresh flowers as you spend a quiet afternoon at the "Courtyard Fountain."